Spend another £91.28 to get FREE DELIVERY! Provides safety isolation rated at 2000Va.c. between aerial lead and socket. 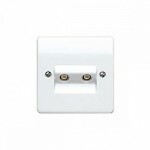 Single outlet for connection to a single TV or FM co-axial aerial lead. Twin outlet with TV/FM diplexer for connection to single co-axial aerial lead with combined TV & FM signals.